Dorie's Perfect Party Cake. It is what it says. 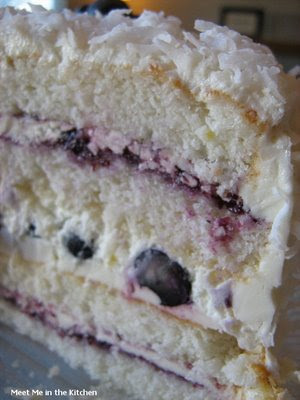 Last year I made it with blueberry preserves and added a layer of fresh bluberries and sweetened whipped cream in the middle. I made it for Father's Day last weekend, but I can't download any of my pictures yet, since my computer is not set up. I will update this post with pictures in a couple weeks when I am able to get my pictures downloaded. 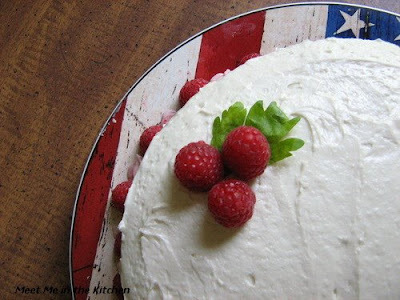 This week's Tuesday's with Dorie recipe, Perfect Party Cake, was chosen by Carol of mix, mix, stir, stir,. It was also done by the Daring Bakers last year in March, so you have probably seen some version of it. 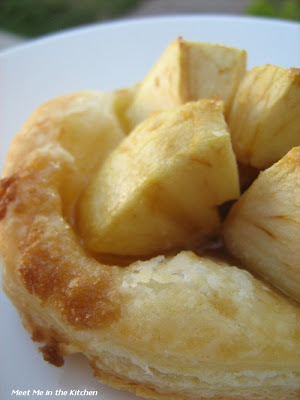 You can find the recipe on Carol's blog, from the post I did last year, or on just about any other food blog out there. I promise. 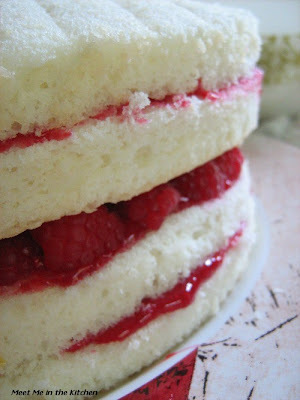 I made it again because my sister-in-law wanted a white cake with raspberry filling for our Father's Day dessert. The cake is flawless. I haven't had trouble with it and I always use buttermilk, which goes well with the lemon flavor. This time I used a different frosting because the original frosting is too loaded with butter for me and last summer when I made it, none of us really cared for the frosting. 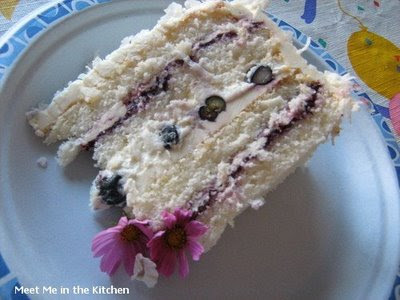 This time around, I used this basic Vanilla Buttercream from Southern Living. I also made up my own raspberry filling and everyone really loved the results. Go check out the TWD Blogroll to see the other party cakes! I like health foods and health stores. They are just so much fun. A couple of months ago, I tried soba noodles for the first time and this is the recipe I used. I was seeing recipes pop up all the time in magazines and on the web, that used soba noodles, so I finally grabbed some. 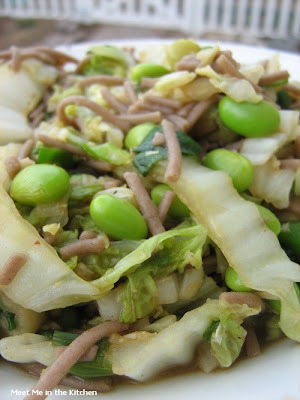 This recipe also includes edamame, which is one of my favorite foods. This was a great dish, that we all enjoyed, but I thought that the hoisin sauce flavor was a little too strong. If you love hoisin sauce, than that won't be a problem, but if I were going to make it again, I would cut back on that a little bit. I also reduced the amount of oil that the veggies were stir-fried in, because I think a little oil goes a long way. This was ready really quickly and had lots of green veggies, so it was good, quick dinner. 1. Bring a large pot of water to a boil, salt it, add the pasta and cook until al dente. Drain. 2. While the pasta is working, in a wok or large skillet, heat the oil over high heat until rippling. 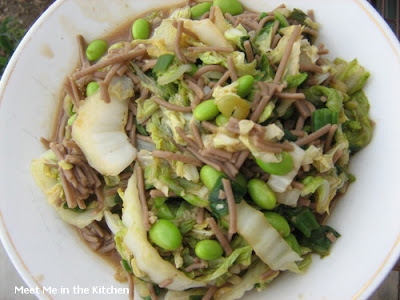 Add the cabbage and edamame and stir-fry for 2 minutes. Stir in the scallions, garlic and ginger and stir-fry for 1 minute. Stir in the hoisin sauce, soy sauce, lime peel, lime juice and black pepper. Add the pasta, mint and basil and toss. This is a dinner that I made a couple of months ago. I am nearing the end of the recipes I have left in my drafts and this is one meal that was simple and delicious, but somehow just kept getting pushed out of the way. I mean, why post dinner when you can talk about dessert, right? I am kidding of course, but sometimes cakes and cookies are more fun to look at. I don't remember exactly where I found this recipe, it was either Southern Living or Cooking Light. It was fast and easy. I liked the fact that this used turkey, which is lean and healthy, instead of chicken. A little variety in the protein area of our meal. I like variety. 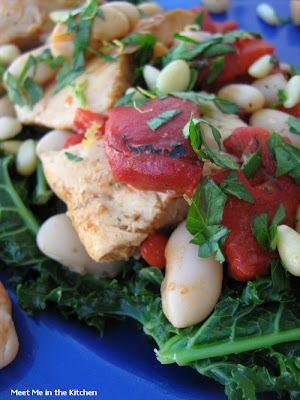 I served this meal over sauteed kale and we really liked it. Prep: 20 min., Chill: 30 min., Cook: 15 min. Be sure to grate the lemon rind before squeezing the juice needed for the recipe. 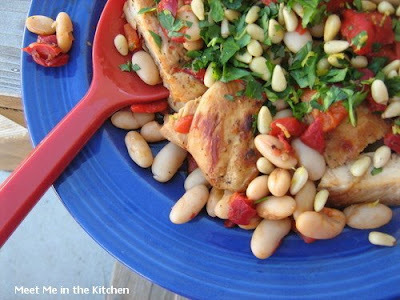 Use the entire 2 tablespoons of lemon juice in the marinade if you like a tangier flavor. Pierce turkey slices evenly with a fork. Stir together Italian seasoning, 1/2 tablespoon oil, lemon juice, and next 3 ingredients. Coat turkey slices with oil mixture. Cover and chill 30 minutes. Cook turkey slices, in batches, in remaining 1 tablespoon hot oil in a large nonstick skillet over medium heat 3 minutes on each side or until done. Remove turkey from skillet, cover, and keep warm. Add beans and peppers to skillet; cook over medium heat until thoroughly heated, stirring gently. Cut turkey slices crosswise into 1/2-inch strips. Arrange on a serving platter. Top with bean mixture. 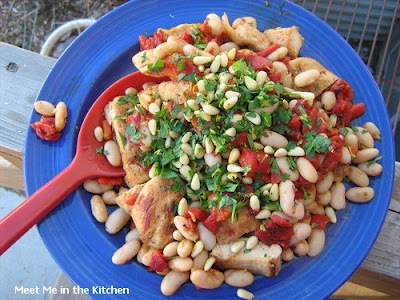 Combine pine nuts, grated lemon rind, and parsley. Sprinkle over beans. Serve immediately. 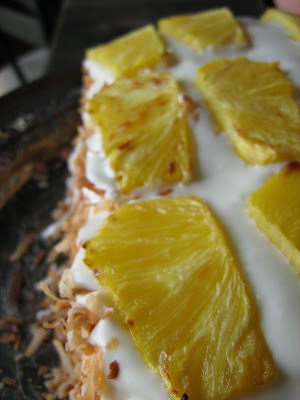 This week's TWD recipe, Coconut Roasted Pineapple Dacquoise, was chosen by Andrea. You can find the recipe on her blog, Andrea's Kitchen. The picture of this dessert is one of the first ones that caught my eye when I bought this cookbook. It was my 2nd choice when it was my turn to pick the recipe back in January, so I was pretty thrilled when I saw it was one of June's recipes. Honestly, I was a tad bit intimidated by this recipe. That is the reason I haven't ever made it on my own. Usually, if there is something that I want to make, I just do it. This dessert needed a special occasion. It needed extra time and now it was finally time to make it. 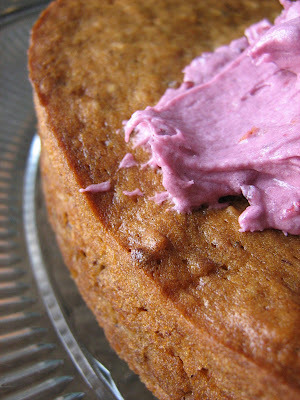 and the Lots of Ways Banana Cake with Blackberry Sherbet. I was surprised that this recipe was not as difficult as it seemed. It had many parts, that had to bake or rest for long amounts of time, but none of the steps were that hard. I halved this recipe since we were having so many other treats that night and that enabled me to bake my meringues all on the same baking sheet. They were 6x3 inch rectangles. A dacquoise is "layers of nut meringue and whipped cream or buttercream. It is usually served chilled and accompanied with fruit."-Wikipedia. In this case the meringue base was made with almonds and served with layers of white chocolate ganache. 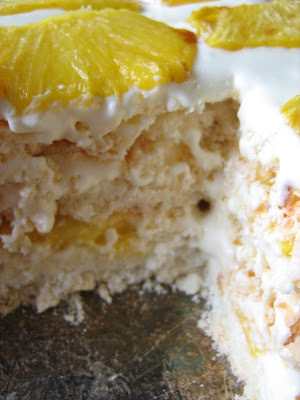 Those layers were topped with roasted pineapple. I had a little trouble with the white chocolate ganache just because I was scared to overbeat it, so it was a little bit runny. 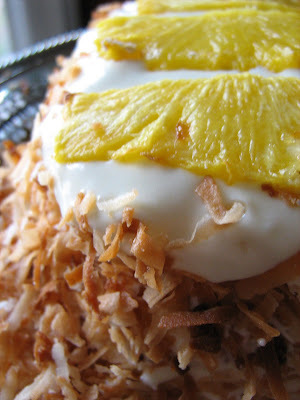 That made the putting together of this dessert a little messy, but the toasted coconut covered it and no one seemed to mind. Everyone was very impressed with this dessert. It was crunchy and cold and all the flavors were delicious together. I am so glad we got to make this. To see what the other members of Tuesday's with Dorie thought, check out the TWD Blogroll! I hope everyone had a great weekend. We had fun yesterday. I was in charge of the menu at my mother-in-laws and it turned out great. I also suggested some menu items to my family in Utah and I think they enjoyed them. This recipe is for a muffin I made a couple of months ago. 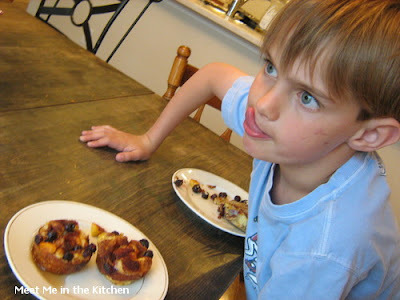 As soon as I saw this muffin recipe, I knew it was something that my younger brother would love, love, love! He is only 17 and a bit of a health nut. 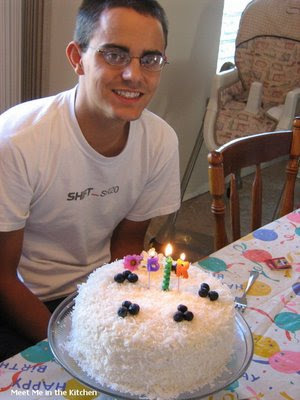 He loved everything I ever baked or cooked and that made trying new things lots of fun. 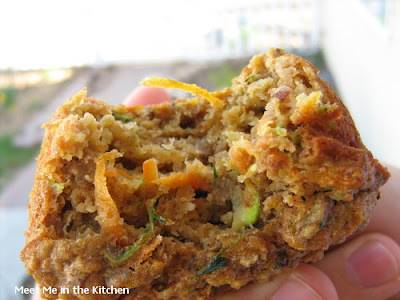 This is a really healthy muffin, loaded with shredded zucchini and shredded carrots. It has wheat germ and yogurt and whole wheat flour. 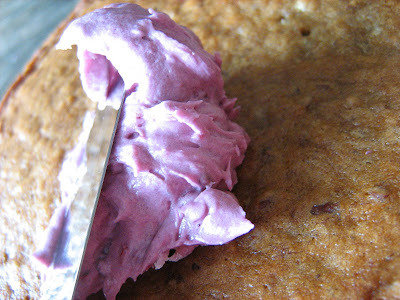 Unlike some healthy foods that don't taste healthy, this muffin does. But, I don't think that is a bad thing. I know some people might argue with me about that. It also has a hint of molasses flavor. My brother loved these. He even hid some in the pantry, so that no one would take them. That made me laugh when I found his little stash. If you need healthy snack, here you go! Egg whites beaten to stiff peaks ensure that the texture of these whole-grain muffins remains light. 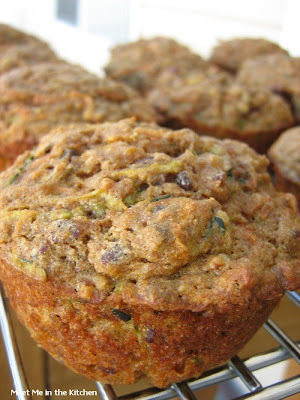 Fresh carrots and zucchini keep these muffins moist. Preheat oven to 400 degrees. 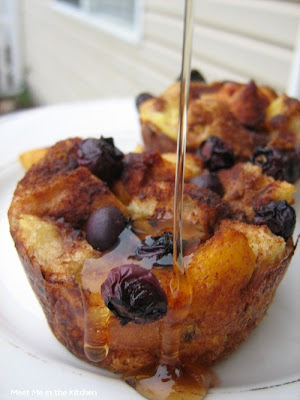 Coat a standard (12-cup) muffin tin with cooking spray. Whisk together flours, pecans, wheat germ, brown sugar, baking powder, baking soda, cinnamon, and salt. Stir together carrots, zucchini, yogurt, egg yolks, molasses, and orange zest in a large bowl. Fold flour mixture into carrot mixture until just combined. With a whisk or a mixer fitted with the whisk attachment, beat egg whites until shiny, stiff peaks form. Gently fold egg whites into the carrot mixture. It is really hot today. Don't you think so? We have been swimming everyday in grandma's pool and today we decided that we would go to the library. It was about 10:30 in the morning and I was thinking about what else we could do to keep ourselves busy. We stayed at the library for 4 1/2 hours. We missed lunch. My youngest took a nap on my lap. And I was the one who finally spoke up and said that I was hungry so we had to go. That really has nothing to do with this post, but I just found it humorous that my children were so entertained by the library. 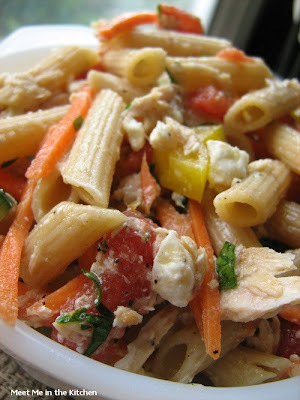 I made this pasta salad about 6 weeks ago. I don't remember all the things I changed about it, but as soon as I made it, I wrote down the changes to the recipe and so, the recipe below is my version of the recipe. 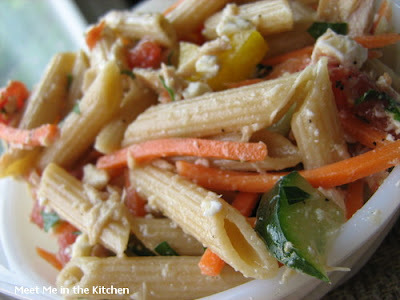 I added a couple extra vegetables and used whole wheat pasta. This would be a really great option for a really hot day (like today), because you only have to boil the pasta and if you have some leftover, cooked pasta in the fridge, then you can just whisk up the dressing, have a quick lunch or dinner, and keep your house nice and cool, by avoiding the use of the oven. 1. In a large pot of boiling, salted water, cook the pasta until al dente; drain and spread onto a baking sheet to cool. 2. Meanwhile, pour the vinegar into a large bowl and whisk in the olive oil in a slow, steady stream. Stir in the tomatoes, cucumber, yellow pepper, and carrots. Add the pasta and parsley and toss; season with salt and pepper. Stir in the tuna. Top with the feta. Some things just have to be revisited. Last summer, I checked out The Food You Crave by Ellie Krieger from the library and chose 4 recipes that I wanted to make right away. One of them was Peach French Toast Bake. 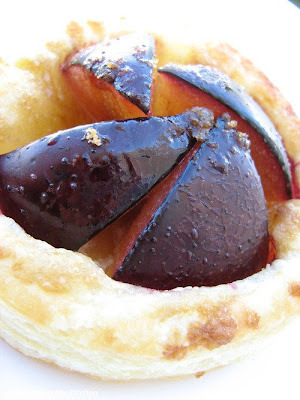 When I made it last summer, I added some blueberries and blackberries to the peaches that go on top and it was a delightful breakfast. A couple of weeks ago, I had a loaf of french bread that was a little stale, so I decided to make this breakfast dish again. 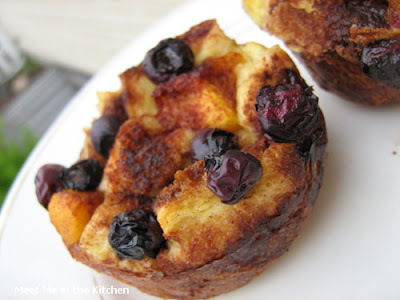 We had some frozen peaches left from last summer and I decided to turn the french toast bake into single servings by cutting the bread into cubes and baking them in a muffin tin. I just put some bread cubes into each well of the muffin tin and poured the egg/milk mixture over top. I added the peaches and blueberries, covered them with plastic wrap, and set them in the fridge overnight. I also reduced the baking time by about half. My family really likes this breakfast. If you need a filling and nutritious breakfast that can be put together quickly the night before and then just popped in the oven in the morning, make this one! 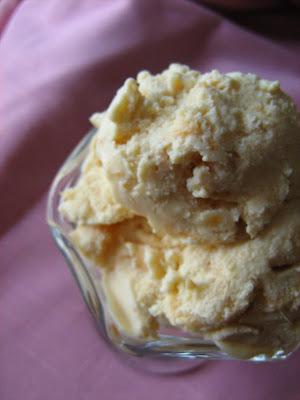 This weeks recipe, Honey Peach Ice Cream, was chosen by Tommi over at brown interior. 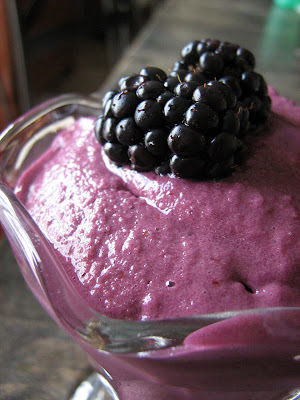 You can get the recipe by visiting her blog. I didn't know if I would have time to make the recipes for June, since we were about to move across the country, but I made time for them. My friend wanted me to make her ice cream before I moved, so this was the perfect opportunity. Except for the fact that peaches aren't ripe in Utah until about August. My parents have a peach tree in their backyard and boy, did it produce gorgeous, delicious, beautiful, juicy, huge peaches by the bushel last summer. We had so many we didn't know what to do. I made peach pie, Dorie's Dimply Cake with peaches, peach ice cream, smoothies, chiffon cake with peaches as the filling- I mean, you get the idea. We had so, so many and so, we froze a bunch of them too. 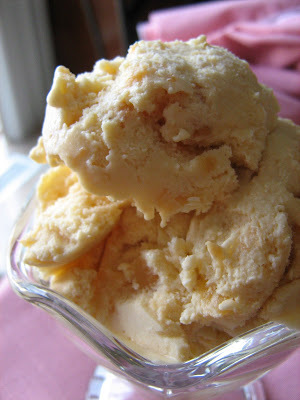 I used those delicious frozen peaches for this ice cream. 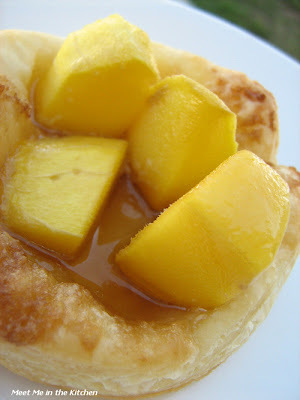 I followed Dorie's instructions and pureed half the peach-honey mixture and left the other peach mixture in chunks. Having the peach chunks in there, didn't really bother any of us. The only thing that most of my tasters noted was that this ice cream tasted much better after it had ripened in the freezer for 24 hours. I made it in the morning and it had time to sit in the freezer for a couple of hours, but it tasted much better the next day. Go see what the other TwDer's thought about this fabulous frozen treat by checking out the TWD Blogroll! 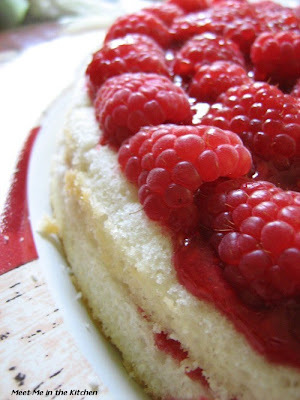 I found this recipe quite a few years ago, in Parents Magazine and I have been making variations of it ever since. It is easy and gets lots of veggies into a nice meal. The original recipe uses ground sirloin and I have made it in the past with beef. I don't really eat beef anymore, so the past few times I have made it, I have used ground turkey breast. Basically, any ground meat would work. 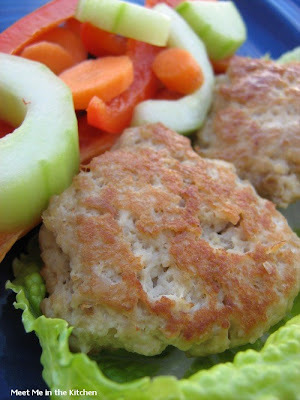 If you use ground turkey breast, you just have to watch the patties close, because if you cook them too long, they will be dry. Sometimes, I add a little chicken broth to the pan while they are cooking, just to keep them moist. The cream of coconut and anchovy paste really makes the flavors great. My kids really enjoyed this meal because it is something that you can eat with your fingers and everything is close to bite size. 1. In a bowl, combine coconut cream, bread crumbs, soy sauce, ginger, garlic and anchovy paste. Add turkey and gently combine until well mixed. Shape meat into 12 small patties, cover and refrigerate until ready to cook. 2. In another bowl, combine cucumber, carrot and red pepper. In a medium saucepan, combine vinegar, sugar, salt and 1 cup water. Bring to a boil, remover from heat and pour over veggies. Let sit for 3 minutes, then drain, reserving liquid. 3. Heat grill or skillet over medium high heat. Grill patties until cooked through, about 3 minutes per side. Serve in lettuce leaves with vegetables and rice on the side. Dip in reserved liquid. The weekend before we moved, a couple of my friends and I got together for a little party. I was debating if I had enough time in-between packing and everything else, to bake a couple of things for our get-together. Well, of course- I had time. 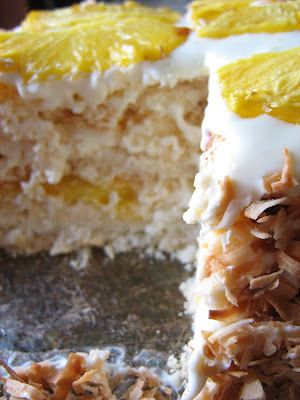 The day of the party, I made this cake and sherbet, Honey-Peach Ice Cream (which will post next tuesday) and one of the most phenomenal desserts ever- Coconut Dacquoise with Roasted Pineapple (that will post a week from tuesday). I like bananas. But, they have to be just the right texture for me to eat them out of the peel. If I see a brown spot on the peel, I set them aside and decide that they will be used for baking. 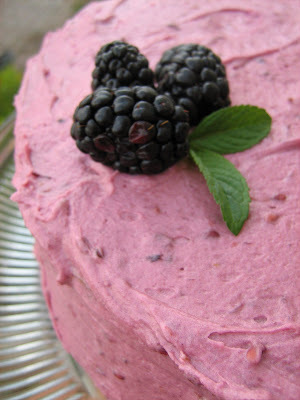 I had a couple of bananas that were begging to be made into something delicious and also had lots of fresh blackberries, because the price really great on them at the store. I spotted the frosting recipe and thought it looked beautiful and sounded really good. 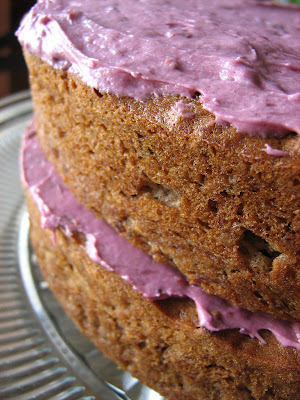 I have made this banana cake before and it is really versatile, so I knew they would be a great combination. And since I was making all of this stuff anyway, I decided I might as well throw in a simple sherbet recipe just for fun. 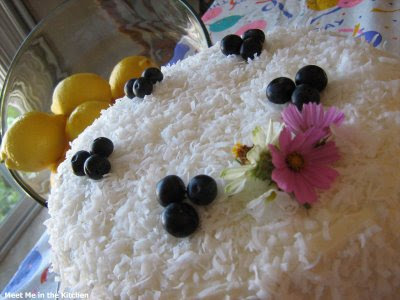 You can use whatever you have on hand to make the cake- coconut milk, whole milk, buttermilk, plain yogurt- anything. I have made it with coconut milk before and it was delicious. I don't even remember what I used this time, but it was good. I also added chopped, toasted pecans to the batter. 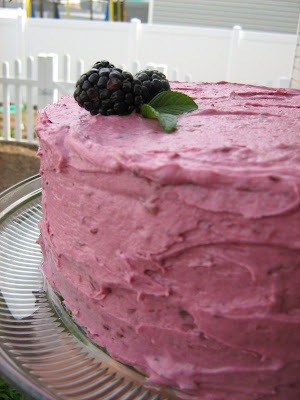 The frosting was a lovely color and everyone raved about it, but I thought it could have used a little bit more of the actual blackberry flavor. The sherbet was so, so easy. I have used this method before where you just blend the ingredients up and freeze it for a little while, then process it in the food processor and either serve it or freeze it for awhile longer. It is a really easy method. The sherbet called for buttermilk and that gave it nice sourish tang- I would use a little bit less sugar next time- I thought it was a little too sweet. Nice color and also raved about from my friends. It was a fun night. Good friends and dessert- what could be better? Getting Ready: Center a rack in the oven and preheat the oven to 350 degrees. Butter two 9-x-2-inch round cake pans, dust the insides with flour and tap out the excess. (I used Crisco Baking Spray with Flour). Put the pans on a baking sheet. Working with a stand mixer, preferably fit with a paddle attachment, or with a hand mixer in a large bowl, beat the butter until creamy. Add the sugars and beat at medium speed for a couple of minutes, then add eggs one at a time, beating well after each addition, followed by the vanilla and rum. You'll have a beautiful satiny batter. Now lower the speed and add the bananas-the batter will curdle, but that's fine; it will come back together as you add the remaining ingredients. Still on low speed, add the dry and liquid ingredients alternately, adding the flour mixture in 3 portions and the coconut milk in 2 (begin and end with the dry ingredients). Mix just until everything is incorporated. Switch to a rubber spatula and gently stir in the coconut. Divide the batter evenly between the two pans. Bake for about 45 minutes (mine were done in 42), or until the cakes are a deep golden brown. They should start to pull away from the sides on the pans and a thin knife inserted into their centers will come out clean. Transfer the cakes to a cooking rack and cool for 5 minutes, then unmold and invert onto another rack to cool to room temperature right side up. 1. 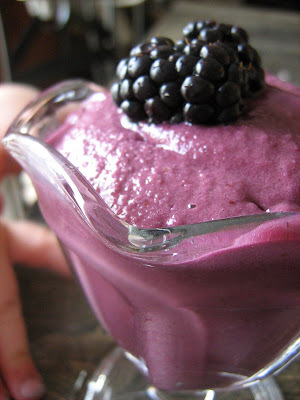 In a food processor, combine blackberries and sugar; cover and process until smooth. Strain and discard seeds and pulp. 3. Transfer puree to a 13x9-inch dish. Freeze for 1 hour or until edges begin to firm. Stir and return to freezer. Freeze 2 hours longer or until firm. 4. Just before serving, transfer to a food processor; cover and process for 2-3 minutes or until smooth. I love summer. I love the hot sun and now that we are back in Georgia, I have to admit it- I love humidity. I used to crave it when we lived in Utah and I remember the one day that I could actually feel humidity in the air when we lived there. It felt good in my lungs. I know I must sound crazy, but I actually like exercising in the humidity, too. Another thing I love about summer is the wonderful variety of fresh fruits and vegetables that are in season. Doesn't everything just taste better in the summer? I love going to farmers markets and enjoying the fresh produce from the garden. This is a great salad for any season. The simple syrup could be flavored with any citrus flavors and the combination of lemon and orange is really good. 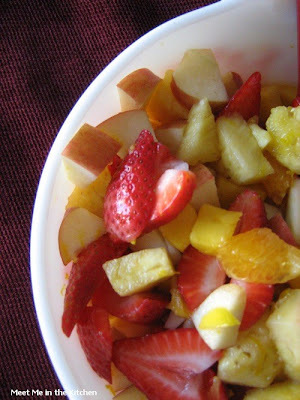 This salad is great with any fruit you might have on hand. I took it to a party, so I threw together the fruit I had and just happened to have red, orange and yellow fruits in the bowl. Yum! Combine sugar and water in a small saucepan. Bring to a boil; remove from heat immediately. Stir in lemon and orange juice and zest. chill. Prepare fruit. Stir into chilled syrup, so all is coated. 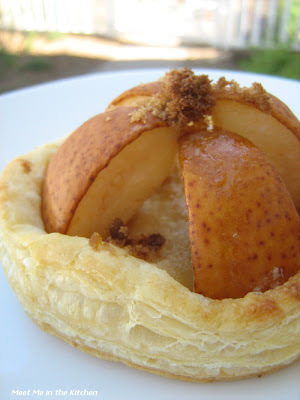 This week's Tuesdays with Dorie recipe, Parisian Apple Tartlet, was chosen by Jessica, who blogs over at My Baking Heart. You can find the recipe on Jessica's blog. 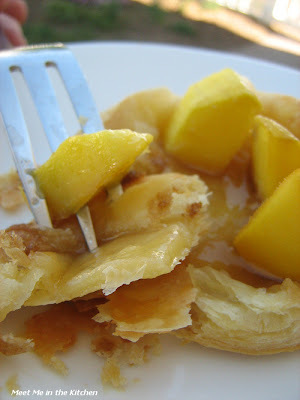 This recipe is easy if you use frozen puff pastry. I was just trying to get as many recipes for TWD as I could, out of the way before we moved to Georgia. I used the frozen puff pastry I found at my local grocery store (Pepperidge Farms), even though Dorie suggest using an all-butter puff pastry. 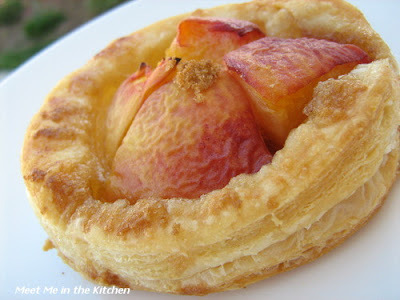 I was in a hurry, so I didn't even think about making the puff pastry from scratch. I did use as many fruits as I could find though. 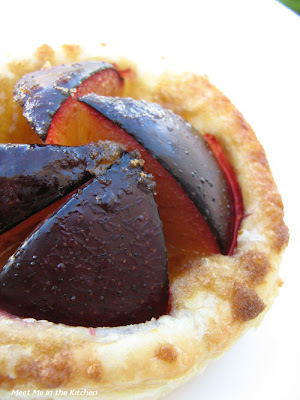 I made the tartlets about an inch smaller than Dorie suggested and made 12- 2 with each kind of fruit. 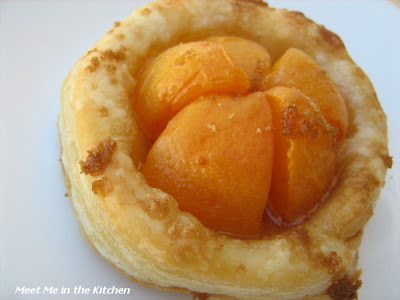 The favorites in our house were those made with peaches and plums. 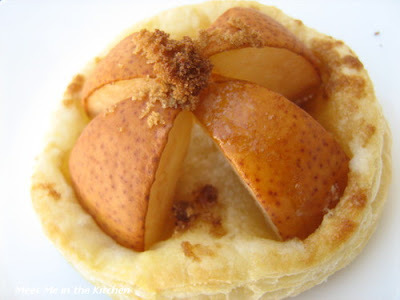 The topping fell off the apple tartlet and it didn't turn out very pretty, so that is why the pic of that one is at the very bottom of this post. 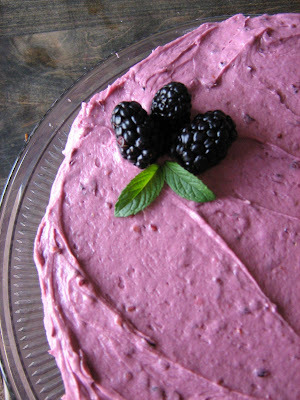 This dessert would be a great ending to a party or a fun dessert to make with young kids. Check out what all the other TWD-ers came up with by going through the TWD Blogroll!